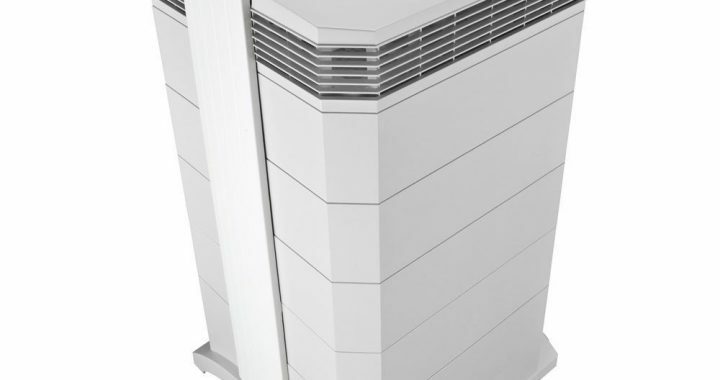 Alen BreatheSmart FIT50 is one of the best compact air purifiers nowadays. It can handle up to 800 square feet large spaces. It has a lot of great features such as automatic smart sensors, changeable panels and filters and a lot more. Alen BreatheSmart FIT50 air machine has a simple but modern design. The best part of it is changeable panel colors such as brushed stainless, graphite, gold champagne, espresso, even pink and more. Control panel is on the top of the air purifier, looks elegant, easy to understand buttons. Air input comes from the side and bottom but the output is at the upper backside with child-friendly vent guard. Alen BreatheSmart FIT50 height is 22.25 in (56cm), width 16.75in (42cm) and depth 10in (25cm). Weight is 16lbs (7kg). Not too heavy for this size, easy to move it with built-in handle. 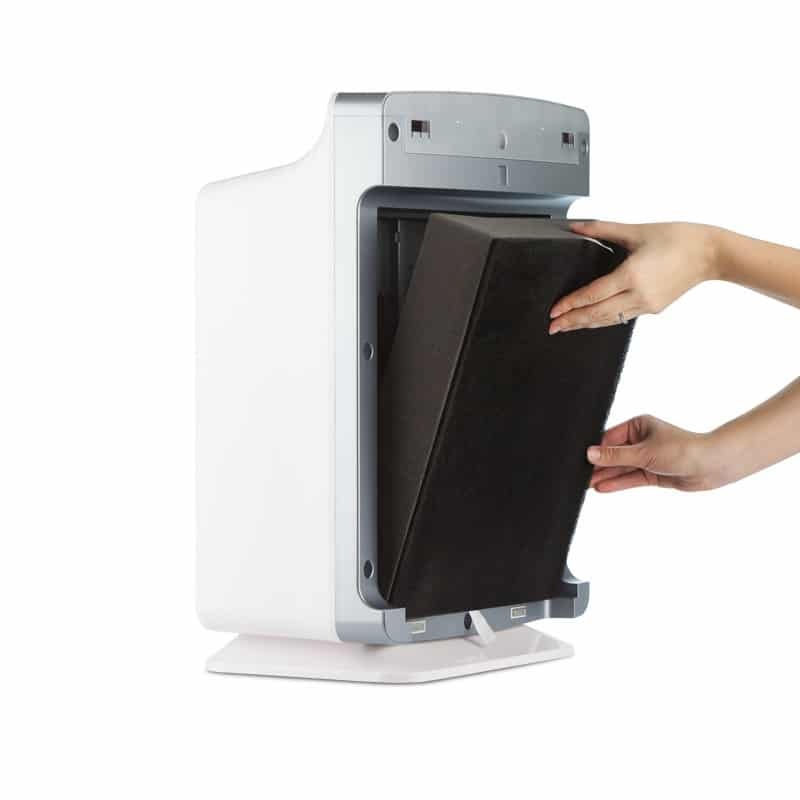 Alen BreatheSmart FIT50 has a 3-stage HEPA-style filter system and is customizable. First is washable pre-filter. Air passes through it first and largest particles such as dust, lint, and hair are captured there. It also helps to extend main filter life. Then comes HEPA-pure filter. It removes 99% of particles greater than 0.3 microns from the air such as pollen, pet dander, mold spores, and other airborne pollutants. For more specific filtration you can upgrade HEPA filter. 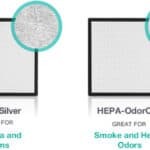 Paying extra $15 you can get HEPA-silver which is great for germs and bacteria. Paying $20 you can get an HEPA-FreshPlus filter which is perfect for chemicals and VOC’s. But for paying extra $30 you will get HEPA-OdorCell, this will handle smoke and heavy odors. Ozone-Safe Ionizer. This comes as the last step, it delivers negative ions into the air. 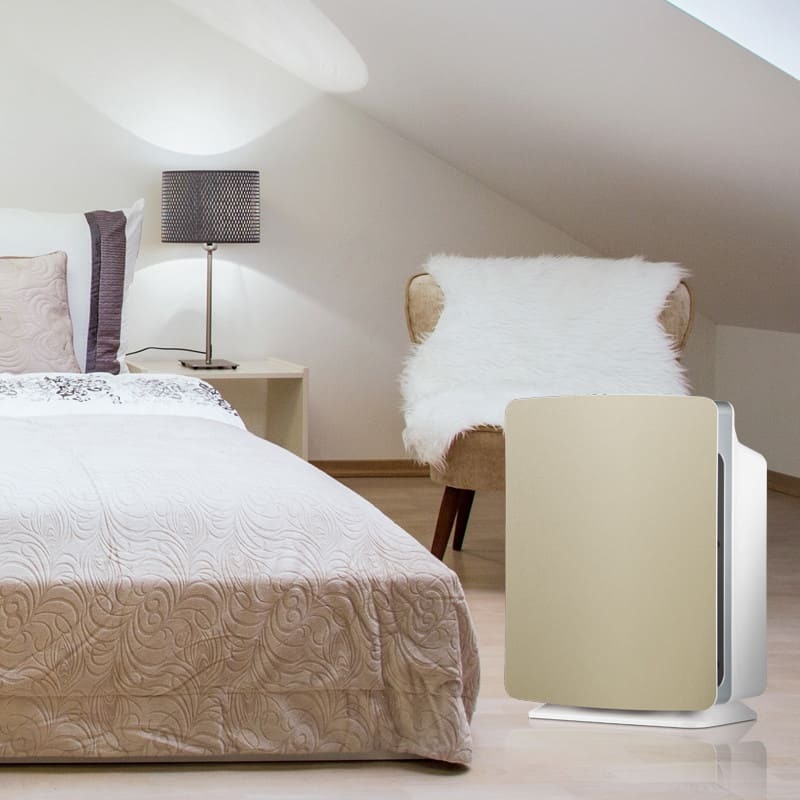 That helps the air purifier capturing particles more efficiently while purifying your indoors. Alen BreatheSmart FIT50 has numerous magnificent features. Filter life indicator. It has 3 lights: green, yellow and red. It will be green regularly. The yellow light will appear on quickly before your filter should be replaced. Start to find new filter because when it turns into the red you will have to change filter immediately. Timer allows you to choose how long air purifier should work. Available 2, 4 and 12 hour periods. Power/Sleep Mode. Auto-off safety feature when the front cover is detached. Lock/Unlock the control panel button. Turbo (Speed 4) setting is pretty loud. 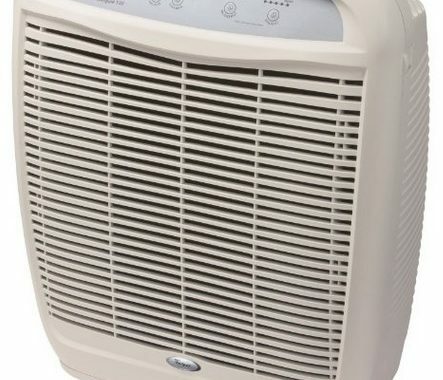 If you have bad air quality and are working this air purifier on auto-mode it will be noisy. You will have to replace filters but don’t worry – this is an easy process. I suggest cleaning the pre-filter (the Alen Pre-Filter can be washed or vacuumed) every 2-3 months and replacing the HEPA-style filter at least once per year with normal use and every 12-18 months with irregular use. The Alen BreatheSmart’s Fit50 will show you exact replacement time with indicator lights. The optimal filter replacement cycle may vary based on your conditions and health concerns. With Energy Star, an air purifier is 40% more efficient than standard models and can save you up to $25 annually on your operating costs. Minimum wattage – 36W, maximum 60W. Alen BreatheSmart FIT50 is a really great choice for your home. It works great in spaces up to 800 square feet (74 m2) large and you can even personalize filtration based on your needs. Unique design panels allow you to select best for your interior. SmartSensor technology will automatically adjust itself to the pollutants in your air, turning between 4 fan speeds up or down as needed. I am not 100% sure does ionizer produce ozone, but you can just keep it turned of f.Have to choose between filters. Can’t combine them together. Have to choose between filters. Can’t combine them together. 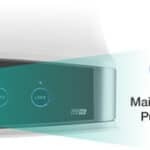 Posted in Air Purifier Reviews, Reviews and tagged Air Purifier, Air Purifier review, Alen, Alen air purifier, Alen BreatheSmart FIT50.